More and more DJs are now using a laptop or computer for music playback, normally coupled with a specifically designed program such as Traktor or Virtual DJ which includes features to enhance your mixing and overall performance. Performing from a laptop can be somewhat cumbersome and limiting, therefore many DJs have incorporated a controller into their set up. This can present another problem, fitting both a controller and mixer into your rack or flight case. 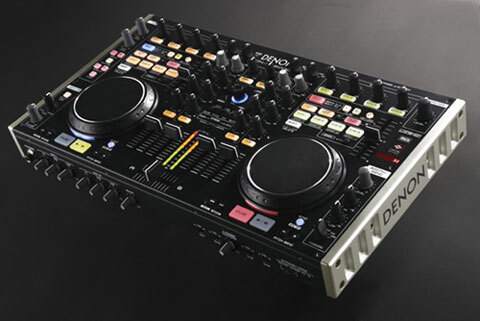 Denon DJ have the solution with the highly acclaimed MC6000 which combines the two into one neat unit. Attachable metal brackets enable you to rack mount it in a standard flight case. At just 25.5 cm by 44cm with a depth of 5cm, this is a very compact solution. The MC6000 has a sturdy metal construction. At first glance, you could imagine yourself at the flight deck of the shuttle with a multitude of knobs, buttons and faders. All have their purpose; with positioning and design carefully planned for ease of usage and functionality. The buttons and switches look packed in but this doesn't cause any problems as each lights up when that function is being utilised. With four decks, it can be connected up to both a digital system and turntables/CD player. Although it is marketed as a controller, it is also a high performing mixer in its own right. For digital use, it has been designed to work with, and compliment, Traktor and Virtual DJ and can connect to either a PC or Mac (switch at the back). Four decks with only two visible has been accommodated very cleverly with a simple press button to switch Deck A to C or B to D. So that you don't get confused with which deck you are on, both the button and the light at the front of the jog wheel change between blue and red. There are too many effects to list here, but a handy one to get to grips with is the loop function (a must when playing Cha Cha Slide or needing to extend a song during a voice over) which can be shrunk or extended whilst playing. There are two mic inputs with controls on top of the unit and additional controls at the front (for EQ and echo). A very handy effect for party DJs is the 'ducking' function which will dip the music when you speak on the mic (ideal if you do a lot of floor work). It would be good to be able to alter the percentage of the 'duck', but that could be a development for the future. In the middle of the unit is a track selection function which enables you to load a song to a specific deck or to the playlist. This negates the need to use the mouse so everything can be controlled from the MC6000. The controls are very responsive. The jog wheel is smooth and slick with the faders being firm and controllable. The layout is logical and easy to navigate and in no time at all you can get to grips with adding effects into your mixes with looping and samples. With an inbuilt sound card and a multitude of useful features, the MC6000 is the complete package for both club DJs and mobile party DJs. After five minutes with this unit, you will have it mastered and be wondering how you ever managed without it! The MC6000 will be on display on the Denon stand at BPM (14th, 15th, 16th September at the NEC Birmingham). There will be opportunity to have a go and assistance will be on hand to talk you through the features. AMPdj will be on stand B73 at BPM so do come along and say hello. See you at BPM 2013! PS Thanks to everyone who came along to the DJ Superstore 25th Anniversary celebrations in Leigh-on-Sea last weekend. 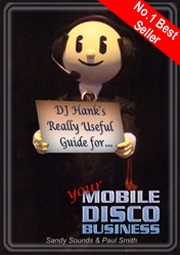 Also to all those who have already purchased DJ Hank's new printed book since its release on Monday. 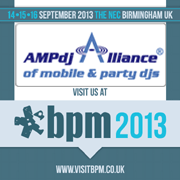 BPM 2013 at the NEC, Birmingham is less than a week away now. We look forward to seeing you there (stand B73). Northampton - Wed 16th Oct an evening of useful advice, demonstrations and top tips from the professionals on ‘Best PA Practice’. "All music is folk music; I ain't never heard no horse sing a song"